This year's hottest short hairstyles are edgier and more modern than in years past. Stylish looks include long bangs with shorter sides, mussy shags and long bobs and even the pompadour, which some of the hottest celebrities of today are pulling off. In this photo gallery, I give you the full scoop on each trend, what face shapes and hair textures work best with them and I provide links to photo galleries showing each trend in much more depth. Plus, you'll find out the best hair products for each look. Would Short Hair Suit You? 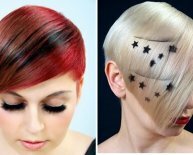 Short hair is so popular this year that several short haircuts also appear in my list of the 20 Hottest Hairstyle Trends of the Year. But which of these popular cuts best suit your face shape and hair texture? The great news is almost everyone can get away with a short hairstyle. Some styles work better with certain face shapes and hair textures. For example, your haircut should give you the illusion of having an oval face shape. So if you have a round face you'll want to elongate it, and if you have a square face, you want to soften your jawline. In my article, How to Tell if You'd Look Good With Short Hair, I share 9 tips to find your best short hairstyles. Don't miss my "Sharpie tip." Coco Chanel said it best in her famous quote, "A woman who cuts her hair is about to change her life.” Here's to life changes. See a photo gallery of pixie hairstyles. Audrey Hepburn was the original celebrity with pixie hair and Mia Farrow popularized the look in the 60s. In the past years, pixie hair has "cropped up" on a host of stylish singers and actresses including Michelle Williams, Ginnifer Goodwin, Emma Watson, Carey Mulligan, Halle Berry and Anne Hathaway. While many pixies are traditionally short all over, the modern pixie tends to be choppy and texturized with longer bangs that give you a ton of styling options. The pixie works best on women with thick, naturally wavy hair. I find the pixie doesn't work as well on fine, straight hair because the hair falls too close to the scalp, looking a bit like a helmet. If you have fine hair, you may need lots of product to add body. What Face Shapes Work With a Pixie? The pixie works best on women with heart-shaped, square and oval faces. It's a good cut for women with round faces, too, just make sure to keep the bangs long and style them forward or up to create the illusion of length. My photo gallery featuring the hottest pixie hairstyles today. Photos of the best pixie styles for older women. Get my full list of products for pixies in The Best Hair Products for Pixie Hairstyles. If you search for "shag hairstyles" on the Internet, what comes up is a lot of dated, rocker girl hairstyles with lots of layers. They remind me of 80s hair bands - a sort of mullet hairstyle gone bad. But the modern shag hairstyle doesn't resemble a mullet and shouldn't remind one of the 80s. What they have in common with those hairstyles of the past are mussiness, choppy ends and layering. The modern shag, however, isn't quite as layered.